The Polish underground not only operated for longer than any other WWII partisan force, but it was also the largest in Europe. The author tells a gripping story that tells the full story in a concise and authoritative review of what has previously been a largely untold story. 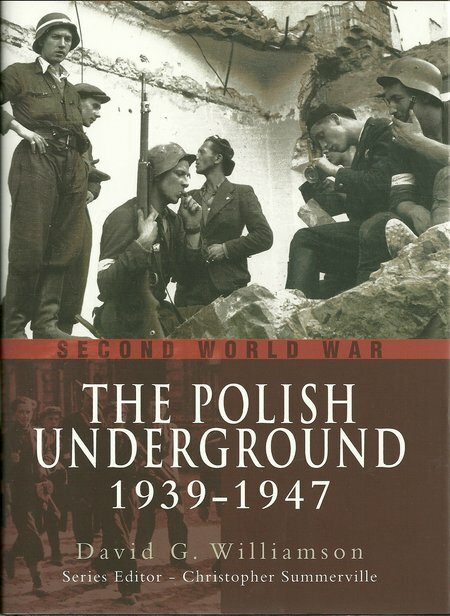 DESCRIPTION: The Polish underground not only operated for longer than any other WWII partisan force, but it was also the largest in Europe. The author tells a gripping story that tells the full story in a concise and authoritative review of what has previously been a largely untold story. The Polish underground’s efforts in acquiring encryption equipment and rocket parts that were sent to Britain is one area that has received some attention in the past but the only story that has been told frequently is of the ill-starred Warsaw Rising were a brave and hopelessly outnumbered group of Polish Home Army fighters took on the German Army while the Russians sat and watched, waiting for the Polish patriots to be killed off. Very little has been written of the continuing battle that was only extinguished when the Communist regime took power with Russian support in 1947. Although Polish underground fighters worked against the Germans from the start of the occupation, the Communists conducted a civil war with the Home Army of Polish fighters. That civil war continued after the Russians had advanced through Poland into Germany in 1945. This is an absorbing insight into a war that lasted longer than World War 2. It is a frequently tragic story but it is also a stirring tale and demonstrates the scope of Polish resistance to German occupation. There is an interesting photographic section with clear text set out in a logical manner. This is a story that should be read because it not only tells the story of Polish freedom fighters, but it adds fresh insight into the way in which Communists prepared to take over the countries of Europe after a German defeat. The size of Polish operations will also surprise many. This is a surprising story and a fitting tribute to those Poles who struggled with such determination and bravery against invaders from West and East.